The perfect combination for property owners with both a wheelie bin and one or two recycling boxes, the Mayfair Wheelie Bin & Recycling Box Store will keep everything out of sight, while still allowing quick and easy access. Made in the UK from FSC timber, this modern bin and box unit looks fantastic, it’s weather resistant, and it will add instant value to your outdoor areas. We all like to do our bit when it comes to recycling, but let’s face it, those brightly coloured recycling boxes do nothing for your curb appeal, especially when combined with a great big wheelie bin! Fortunately, there is a solution, and with the Mayfair Wheelie Bin and Recycling Box Storage Unit, you can keep all your bins out of sight (and mind! ), in one super stylish wooden chest. What Are Wheelie Bin & Recycling Box Stores? Manufactured from quality timber, Wheelie Bin & Recycling Box Stores, are essentially, wooden cupboards that are designed to conceal both your wheelie bin and up to 4 recycling boxes, depending on the model you choose. 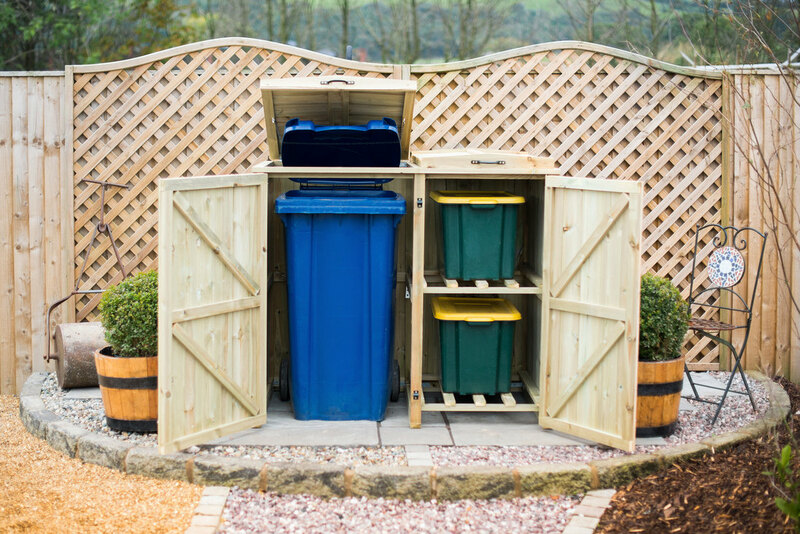 Designed to complement your garden, patio or driveway, they blend seamlessly within the natural environment, creating a secure lock-up where you can store your bins throughout the week, and access them easily on collection day. Suitable for one Wheelie Bin (sizes 140ltr, 180ltr, and 240ltr only), and two standard size council-issued recycling boxes. The Mayfair 1 Wheelie Bin and 2 Recycle Box Store is made from Scandinavian Redwood, a tough and resilient timber collected from FSC sources. Ideal for outdoor applications, this particular redwood has been pre-treated with a wood based preservative to prevent it from rotting when subjected to adverse British weather conditions, and to keep insects and fungus at bay. Designed to last for years to come, it requires minimal maintenance. A simple coat of a stain-based wood treatment applied annually will keep your store looking like new. As with all the wheelie bin and recycling box chests in our collection, this modern Mayfair model is delivered flat packed ready for onsite assembly. Easy to build, it includes clear instructions, and comes with all the stylish black fixtures and fittings as seen on the image above. Specifically designed for use in both rural and urban areas, the Mayfair Wheelie Bin and Recycling Box Storage Unit is fully enclosed on all four sides to prevent unauthorised access from both passers-by and the local wildlife, and it can be secured further with the optional purchase of a Hasp & Staple padlock. Despite its robust structure, this stylish bin store is designed for daily use, and it is therefore extremely easy to access. The lift-up lids include a chain attachment that you connect to your wheelie bin lid so that they both open simultaneously, and the front gates open with ease for quick and easy access on rubbish collection day. If you are tired of having wheelie bins and recycling boxes cluttering up your garden or driveway, the Mayfair Box & Bin Storage Combo is the perfect solution for you. Made in the United Kingdom using only the finest quality materials, it will instantly improve the appearance of your outdoor areas, while organising all of your household waste and recyclable rubbish into one smart wooden chest.